Me bucko Louis told me 'bout 'tis day, 'n i reckon it be a jolly thin' he did. This day be finer than the finest of them gold doubloons n' spiced rum. I be thankful to Louis 'n other buckos fer hostin' such a fine event on a day like 'tis. Why, when Louis told me 'bout 'tis interestin' day, I thought he was kookoo bananas! But now I can spy wit' ye eye why 'tis day makes him grog-filled. Me pals would call me kookoo bananas if I talked like 'tis all the hour! Well, I must be goin'. Mom says I must be off on a wee walkin' adventure now. BOL Christmas! You make one mighty fine pirate, Matey! OMD, Cap'n Chrishook, how do ye walk with that hook on yer front paw? Bravo bravo Christmas...you are one handsome Pirate with a great vocabulary! Thats a perfect talking Pirate Christmas. Have fun on your adventure!! You look AMAZING Christmas, pawsome Pirate! A Pirate's Life For Me. . .
You make a Dashing...or is that a Dachsing Pirate! Yer got a great pirate smile there Christmas! 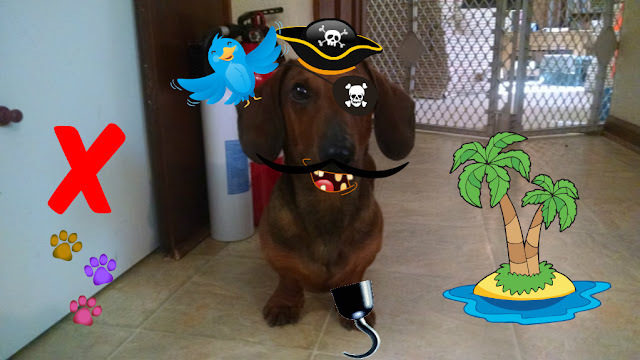 OMD, you are a REAL pirate!!!!!!!!! Christmas, we didn't know you were secretly a pirate! Ahoy Matey!! We hope yer Day twas a good one!! ahoy christmas! hopefully your walk was nowhere near any planks! You make a great pirate Christmas!! Looking good!! awwwhoy cpatain christmas... let's have a bottle of rum together!